The product comes in a sleek plastic ‘pencil’ form which makes storing and travel easy. The plastic material is also a plus because sharpening tends to become messy with wood like material, this way the sharpening scraps come off cleanly and in one piece. The product also includes an appropriately size sharpener, which works great. Overall, the packaging is simple and clean, stores easily and sharpens cleanly. The colour corrector is a creamy formula that glides extremely smoothly onto the skin. It also applies the perfect amount onto the skin; a light thin layer that is buildable and light weight. As for pigmentation the product is highly pigmented and requires little to no effort to make a difference on red areas. The creamy formula blends well into the skin and your foundation however it does not set as quickly as I would wish. This does allow the product to move around if not set by powder. However, when it is fully blended out it does turn into a slight powdery texture which gives the product its smooth feel. Unfortunately, because of its stick formula I would only recommend this product to be used as a spot corrector (acne spots or around the nose) and not a corrector for larger areas. Overall, this product is great for spot correction as it is easy to apply and blends into the skin smoothly. However, it does need to be set with powder if you do not want the product to slip and slide around. The packaging is a relatively basic hard plastic tube with a rounded felt tip. The mouth of the tube has a piece that helps to scrape off excess that unfortunately takes off pretty much all the product off the sides making application difficult. A doe footed applicator would have made it a little easier but that would be the only con for packaging. The size is relatively travel friendly and because it is a affordable product I do not have to worry about it as much when I throw it into my makeup bag. Overall, the packaging is great and decent for the price however, the rounded applicator and scraper makes it a little hard to apply. The Bright Future Color Corrector is a gel like formula that feels light weight but still has a surprising amount of pigmentation. The product is buildable and blends easily with a beauty blender or your fingers (not so much with a brush). The down side is the slightly odd smell that it has, luckily it is unnoticeable when applied to the face. As for longevity the product lasts the day and does not sink into my fine lines when I set the product with powder. Overall, the product does what I need it to do and comes with a nice price, it blends decently well and helps to correct the dark circles under my eyes. Unfortunately, it does have a little of an odd smell and does not do extra to brighten out the area as it claims to – but I am still pretty pleased with the product. The peach tone was alright for my blue-ish purple dark circles but I do wish it did a little bit more to brighten out my under eye area. However, it helps to conceal the darkness and has lessened the amount of concealer I need to use. Honestly speaking I am not a fan of the packaging; I do not even remember what drove me to give it a chance. The label and overall look reminded me a lot of my mother’s old makeup. 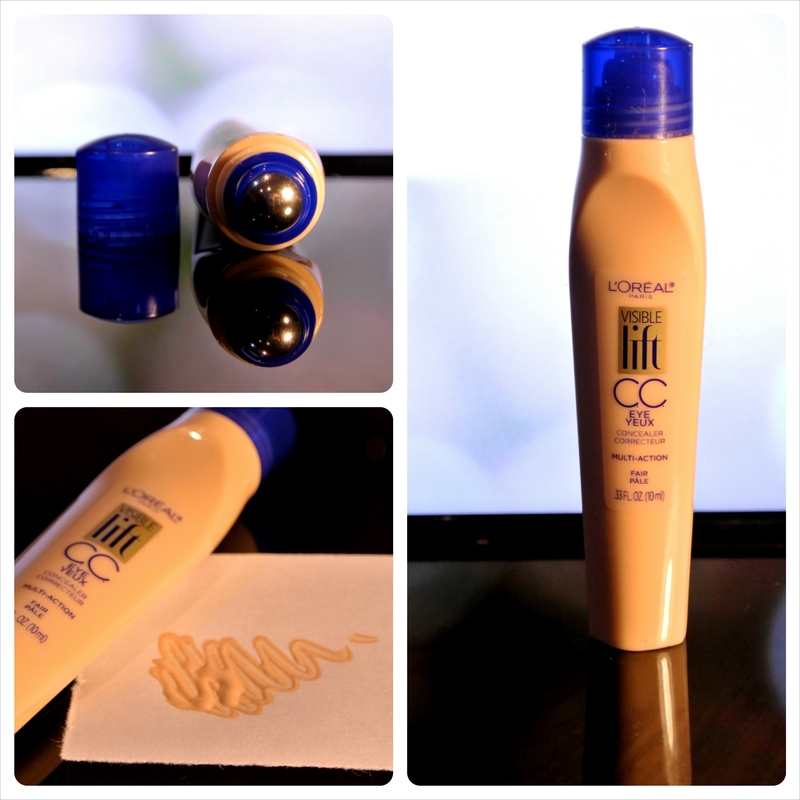 L’oreal carries great products for its price, and have been changing up packing to keep up with times, however, this product did not look new at all. On the positive note, I loved the indented portion which allows you to hold it like a pen. This gave me more control over the concealer allowing me to quickly and easily place the product on desired areas. I also enjoyed the applicator, which is a roller ball that does not tug and pull on your skin. Like many other roller ball product it feels cool to the touch, which is amazing for delicate areas. It is a well known fact that applying cold temperatures onto your dark circles will aid with minimizing the dark and puffy look. Also the roller ball gives you a light message as you apply the product onto your delicate skin. Overall, I loved the functionality however I feel like the look could be re-vamped, because I was not really drawn to the product. The coverage it provides is about a medium – light coverage, which I found just perfect because I do not have a serious problem with dark circles. The product did just enough to cover my dark circles without looking caked on and thick. The product is more of a liquid, which makes blending it into the foundation and skin very easy. The product covers my dark circles but still does not feel like it is suffocating my skin. I have used this on others, when doing their makeup and have also noticed that it blends well into the skin without looking cakey. However, for the ‘correcting cream’ claim I have not noticed anything significant but on the positive side I have not noticed my fine lines getting worse. As for longevity, it lasts all day on my dark circles and does not show signs of fading away. Overall, I loved the product despite its dated packaging; I would recommend this if you are looking for an affordable concealer. For this concealer I tend to apply the concealer on my dark circles after I apply my foundation. I find that this gives the product a smoother surface to sit on; therefore the product will not sink into the fine lines under my eyes. I apply it using long curved strokes a little lower than my water line, starting from my inner eye and moving outwards. Once the product is on my face is use my Sigma foundation brush (F60) in a light patting motion and I slowly blend out the product. After it is all smoothly and nicely blended out I use the Hourglass Ambient Lighting Powder to set the concealer so it stays in place.